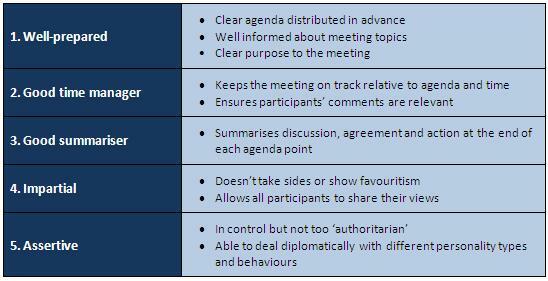 To be frank, you can google “chairing meetings” or “characteristics of a good chairperson” and find literally hundreds of articles outlining (albeit in a lot more words!) roughly the same as the table above. The real question (and so my second one in the training!) is… how? Well, I’m going to show you five strategies that, if consistently applied, will make a significant contribution to your effectiveness as a chairperson. Which issues will be the most ‘problematic’/contentious/complex from the participants’ point of view (i.e. where can you expect the most discussion/disagreement)? Which positions/opinions are you expecting on these points? Will you put contentious points first to ensure they get covered in time? Should you group contentious points together on the agenda or separate them? What exactly should you state at the beginning of the meeting (and how does this contribute to creating a sense of purpose)? How long should your ‘opening statement’ be? → Why it is there – i.e. its purpose: brainstorm? decision? revision? etc. → How you view it – i.e. a simple point? a complex one? a contentious one? Briefly explain/remind participants of the housekeeping rules, e.g. comments via the chair, how to signal to intervene, any suggested limits on the length of interventions, use of mobile phones or other devices etc. Can you use your opening statement as a point of reference during the meeting to ‘nudge’ people regarding time and relevance? How often and when should you summarise the discussion? How exactly should you deal with ‘strong’ disagreement and strongly negative/’emotional’ comments? What’s the best way to ‘unblock’ things if two (or more) sides just can’t find agreement? Is a detailed summary of discussions/decisions/agreements needed? The five strategies outlined above – if consciously employed over time in your meetings – will help you improve your overall performance as a chairperson. So… now it’s over to you! Have you found this article useful? Please contact me at lacstraining@gmail.com if you feel your organisation can benefit from my company’s personalised, cost-effective communication skills training services. Visit www.lacstraining.com to find out more about our communication skills training offer. I have not been part of a meeting wherein the person chairing is someone who was just asked to chair despite having had no experience. But I suppose this happens quite frequently. I concur that chairing is not something that can easily be assigned to someone even if he/she displays competency. It must be given to someone with experience or has under gone enough training. ramblingrye – It does indeed happen more frequently than it should in my experience – a good reason for more training in this area!